Goodreads,the site that lets you share the books you’ve read, are reading, and want to read, says it has just hit the 10 million member mark. That means the company has doubled its registered user base in a little more than a year — 15 months, to be more precise. 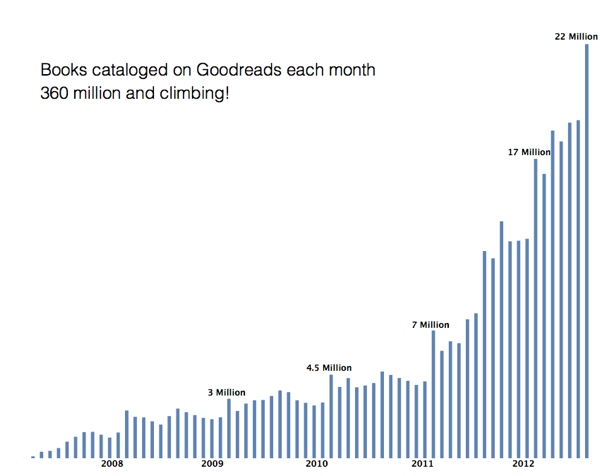 It took Goodreads four and a half years to reach 5 million members back in May 2011. Co-founder and CEO Otis Chandler tells me the “main accelerant of our growth this year” has the company’s new Facebook Open Graph app. He also says Goodreads’ book recommendation engine, which it launched in September after acquiring Discovereads.com, has played a big role in the growth. Goodreads claims to have more catalogued 360 million books, with 22 million (and climbing) added per month. The site sees about 140 million monthly pageviews, Chandler says, and receives about 22 million monthly unique visitors — so Goodreads can deliver a big audience to its advertisers, and also provide them unique data about whether their campaigns are driving engagement in the Goodreads community. The company also just moved into a new 6,000 square foot office in San Francisco. As for what comes next, Chandler says the company is building more features allowing readers to update their profiles as they read a book — so they don’t just say what book they’re reading, but how far they are into it, and any thoughts they have as they read. He also says the company is talking to the Facebook team about building book clubs within the social network (Goodreads already runs book clubs/discussion groups on its own site).